At first glance this work seems simple: a monochromatic glazed terracotta sculpture depicting two nearly life-sized female figures greeting one another. Usually the piece resides quietly in a niche just inside a little-known Romanesque church in the small Italian city of Pistoia, claiming attention from parishioners but not many tourists. Art-filled Florence is a bigger draw, 45 minutes to the southeast. In fact this is a masterpiece, one of the greatest works of Renaissance sculpture, on loan briefly in Boston, USA. It is The Visitation, created early in his career by Luca della Robbia, who is best known for polychromatic reliefs such as the Nativity scene depicted below. In those days Mary arose and went with haste into the hill country, to a town in Judah, and she entered the house of Zechariah and greeted Elizabeth. And when Elizabeth heard the greeting of Mary, the baby leaped in her womb. Della Robbia conveys the power of this encounter as an expression of recognition and adoration, presaging proclamation. On its most basic level the recognition is one of two relatives embracing happily. But the connection between the women is far more than that. Like the boys within them, both Mary and Elizabeth comprehend in faith something of the new reality into which they have entered. Each woman has become a pivotal – albeit supporting – player in a narrative just beginning to unfold: a story of a long-ago promise now being fulfilled. Each is an instrument of God, who is working out his purpose through utterly improbable circumstances, whereby first an elderly woman, long barren, conceives a child and then a teenager conceives too, while retaining her virginity. The fact of these circumstances’ improbability stands side by side with another fact: that nevertheless to all believing Christians the circumstances are true. As God turns the world upside down, this moment is early, tangible evidence that he is making all things new. But so far, only these two women believe it. The contrast with which della Robbia portrays the two figures – far greater than the contrast shown in conventional scenes of the Visitation – accentuates this improbability. Mary is even younger than usual and Elizabeth even older. Elizabeth is wrapped from head to toe in a heavy cape atop countless undergarments, while Mary’s head is uncovered, her ears and the neck of her delicate blouse visible to us. Elizabeth does not bow before her young cousin but actually kneels, as Mary prepares to sing her famous Magnificat. To these women, the greatest mystery is what is invisible: the new life in each of their wombs. The women glimpse a separate and unlikely peace, a peace beyond understanding, known now to them alone as they are held in the hollow of God’s hand. As the hand of God is active in this drama, so also is the hand of the sculpture’s human creator. 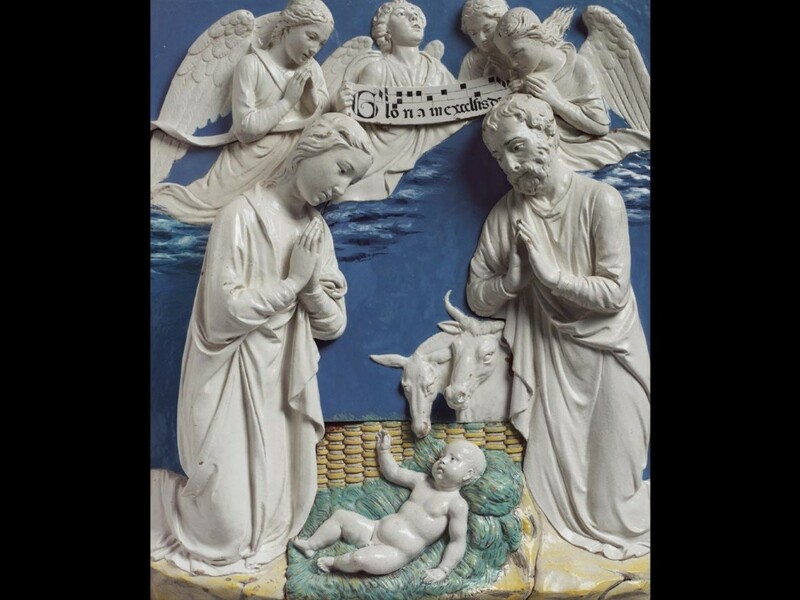 At its most elemental, each della Robbia piece is made of the humblest of materials: clay. The della Robbia workshop controlled an especially fine trove of calcium-rich mud on the banks of the Arno, which family members cleaned and mixed with soft river sand in a laborious and iterative process. The sculptor shaped the clay with subtle care, expressing himself in terracotta in a more lifelike way than ever would be possible in marble or bronze. The press of Mary’s right hand on Elizabeth’s left shoulder, for example, is startlingly fresh and especially tender; two of Mary’s fingers almost cross. Della Robbia then fired separately, twice in relatively small kilns, each of the sculpture’s four interlocking parts. Between the two firings the workshop applied its distinctive and durable glaze. Like the terracotta the glaze is made of ordinary ingredients. The family converted them into a commercially priceless trade secret, depending on unusually high amounts of lead and tin to create both opacity and bright sheen. Here the glaze is applied with admirable restraint, entirely cream-colored with one exception. Della Robbia deploys dark blue in the pupils and irises of both women’s eyes, creating a subtle visual connection between Mary and Elizabeth. Throughout, the sculptor works with materials which are humble yet laden with possibility, as he emulates his own maker. The very name of Adam means “mud-man.” Isaiah teaches us (64:8) that God is the potter, and we ourselves the clay, formed in his hand. So for this sculptor the act of creation is reverent, meek, yet also aspiring to greatness. And in this, his finest work, Luca conveys the highest miracle of all, whereby a single fragile human womb becomes the humble vessel for the Son of God. And so Elizabeth shows each of us the way. Before this greatest work of God, known by faith yet still unseen within the Virgin, the elder woman kneels in adoration. Both cousins’ eyes are wide open, full of rapt attention to one another and to the active work of God in human history. Astounded yet in quiet, they declare that these paired conceptions are both improbable and true, that God is fulfilling his long-standing promise now, in them. Della Robbia takes this private declaration public. With his luminous masterpiece he proclaims this secret joy for all to see. And he invites us, as Advent begins, to recall the love-filled awe which drove Elizabeth to her knees, when in an unexpected moment God brought material hope into this fallen world. At our darkest hour he will save us too, if by grace we put our faith in him. May we know the unseen Lord and tremble in adoration before him as he is born anew in each of our broken hearts, coming with power to redeem us all. Luca della Robbia: The Visitation, about 1445, glazed terracotta, 151 x 148 x 60 cm. Church of San Giovanni Fuorcivitas, Pistoia, Tuscany, Italy, on loan to the Museum of Fine Arts, Boston, USA through 4 December 2016, and then on loan to the National Gallery of Art, Washington, USA (5 February 2017 – 4 June 2017), as the centerpiece of the exhibition Della Robbia: Sculpting with Color in Renaissance Florence. Della Robbia appears to have created this work as an altarpiece for a lay confraternity dedicated to St. Elizabeth, and founded in the first half of the 15th century by the prior of the church in Pistoia. The masterpiece has never before left Italy. 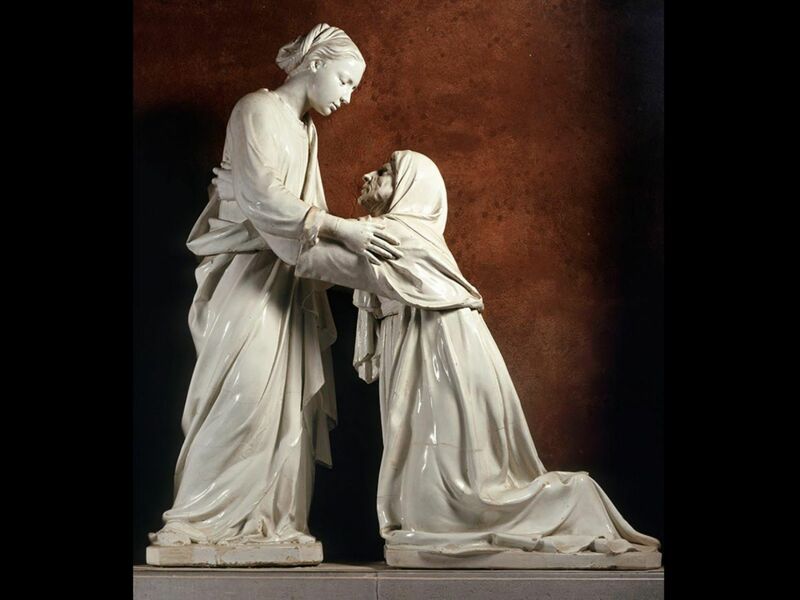 For more on this extraordinary sculpture, see Della Robbia: Sculpting with Color in Renaissance Florence (Boston: The Museum of Fine Arts, 2016), by Marietta Cambareri, to whom this essay is indebted. Luca di Simone di Marco della Robbia (1399/1400–1482), was born in Florence and likely apprenticed to a goldsmith as a young man. In his 30s the artist executed several prominent commissions in marble, including the multi-panel organ loft (or Cantoria) for the cathedral in Florence. No less an authority than Leon Battista Alberti in 1436 named della Robbia one of the five most illustrious Florentine artists, ranked with the architect Brunelleschi, the painter Masaccio and the sculptors Donatello and Ghiberti – each of whom was more prominent than was della Robbia, and three of whom were his senior. Around 1440 the sculptor began producing the glazed terracotta sculptures for which he is best known. His artistic and commercial success in the medium led Luca in 1446 to establish a workshop on Florence’s Via Guelpha (then on the edge of the city, to mitigate the risk of fire spreading from the workshop’s kilns). His nephew Andrea della Robbia (1435-1525), great-nephew Giovanni della Robbia (1469-1529) and several other family members continued to operate the workshop until around 1530, when secrets of the glazing formula and other essential processes vanished as the family died out. Contemporaries regarded the workshop’s sculptures as highly innovative. 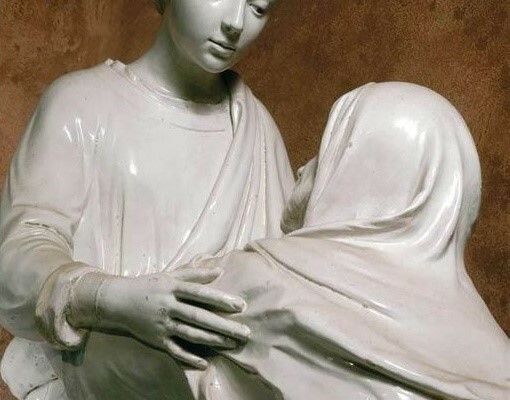 One writer described them as “figures of glass, or rather glazed earth.” Over the last century art historians have generally lost interest in della Robbia sculptures. The superb current U.S. exhibition and its associated catalogue suggest that a positive reassessment of the greatest masterpieces of Luca, Andrea and their workshop is long overdue. William R. Cross writes a weekly column on art and the Gospel for his fellow parishioners at Christ Church, Hamilton, Massachusetts, USA.